When it comes to the business side of Boise City’s Ice World, it has been far from a slick venue. 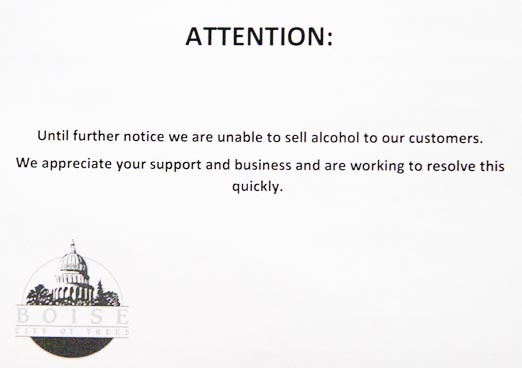 The most recent slip on the ice came when the City-owned booze license was suspended for selling drinks to a minor. Parks director Doug Holloway confirmed the incident to the GUARDIAN when asked about it. The employee didn’t lose his job, but his mistake resulted in a a 10 day suspension of beer and wine sales in lieu of a $500 fine. Boise has similar booze licenses at the airport and golf courses. We question the logic and wisdom of Boise City being in the business of selling alcoholic drinks in a facility frequented by families and juveniles. Holloway said they obtained the license in response to parents wishing to have a beer while watching their kids play hockey. BSU doesn’t sell booze at sporting events nor do local high schools where parents come to watch their kids compete. This misstep pales when compared to some of the past shenanigans. –Criminal charges were brought when the Canadian Mounties tipped Boise coppers that skating items and hockey sticks were being sold on E-Bay which were obviously coming from the City-owned Ice World inventory. –Boise made headlines around the world when the GUARDIAN reported workers drove a pair of Zamboni ice grooming machines through the Burger King drive-in window late at night. –We also noted past complaints of beer cans littering the locker room. You must really hate ice rinks you curmudgeon. These instances you cite happened years ago. You are wrong about BSU not selling Booze at sporting events. At football games booze is sold in the Club seats, Loge seats and in the Suites. And in times past they sold booze in the Cavin Williams. EDITOR NOTE–You are correct. But booze is not sold to the general fan base. Our point here is not the consumption, but rather the city owning and operating a bar in a venue that caters to young people. These incidents are like watching an episode of the Superstore sitcom on NBC. Just want to make sure to clarify that this is organization involved with the strip hockey has nothing to do with the Jr Steelheads program that is currently at Ice World. This was a completely separate program. Personally I thought it was funny as did most people I talked to, same with the Burger King Zamboni run. Yeah, they needed to fire the employees involved, but it’s still funny. A “minor” of 18 drinks a beer. Oh, the horror! What officious, pseudo-moralistic posturing. Why don’t we jail someone too. Geez. Kids in Europe can order a beer in a bar at 16. I never saw an unruly, drunk or obnoxious Italian during my time there. Only drunk Americans. (Brits too) Our drinking culture here is childish. And yes – why is the City in the concessions business anyway? EDITOR NOTE–The bar is not a concession. It is city owned and operated. So free-choice, capitalism, and American lifestyles are being challenged by the Guardian? This post sounds more like a post from the likes of Beiter/TJ Thomson and politicos such as Mayor Bloomberg. THAT has been a theme of the Guardian in the past related to the State competing against private business…. I for one, need a lot of alcohol before being foolish enough to jump on ice with skates. And I oppose the idea of using police resources to trap people being otherwise reasonable. EDITOR NOTE–Not much “capitalism” in a government-owned beer and wine bar. Easterner, You apparently need to lay off the alcohol before you post such illogical comments. Perhaps you think the City should not engage in operating parks with picnic tables, soccer pitches and ball fields. Private enterprise could make that profitable by selling to any age as long as they appear “reasonable”. Let the capitalists self police and keep the harassing cops out. Mistakes do happen. Forgiveness is the obvious path, but difficult none the less (especially for our own actions). The deeper point is when does it become the responsibility of our city to offer alcohol? Parents won’t come if they can’t drink? The line is blurry. I’m off to the dog park. Any chance I can drink there? Better check all the rules, permits, do’s and don’ts, bring a tape measure, and be ready to pay for the privilege. skills facility, or youth sports complex. 250 feet of the Greenbelt. That’s not too much to remember is it? Hummm caters to young folks. I always think it is interesting that in the Skyboxes at BSU they sell ice cream that you have to be carded to buy…. This is hysterical. Can you please put a link in the story source? I want to read about all of them. Keep up the great work. This type of story is the reason I keep coming back to your site.